Structural breakdown of epithelial architecture is a cardinal hallmark of carcinomas - the most common forms of cancer. Our cells contain tumor suppressor genes that act as gate-keepers to prevent tumor growth. One such classical tumor suppressor, Liver Kinase B1 (LKB1), was identified as being responsible for the hereditary cancer predisposition syndrome, Peutz-Jeghers syndrome. It has later been shown to be mutated in other cancer types, such as lung cancer. 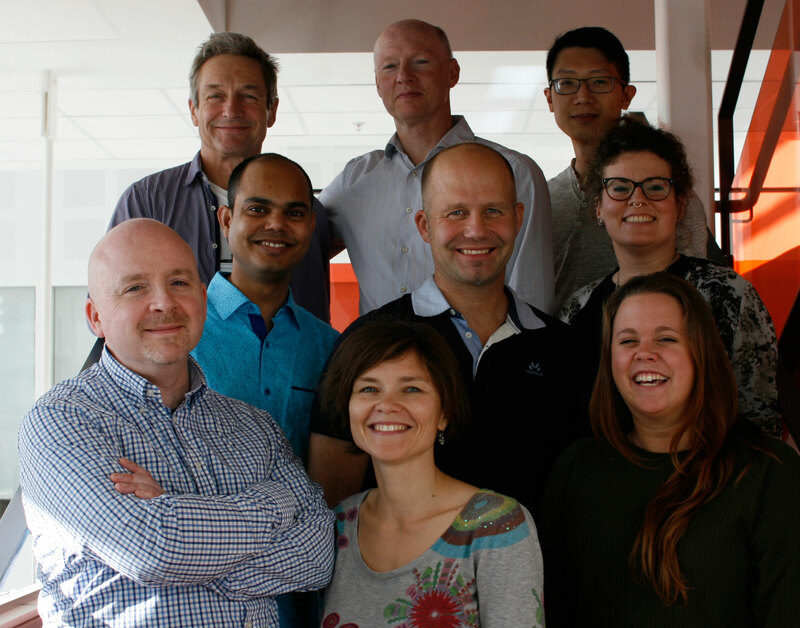 Reporting in the prestigeous journal Nature Cell Biology (IF 20,6), O´Farrell and colleagues now reports that intracellular endocytic trafficking of LKB1 is essential to curtail Lkb1 activity from going rogue. In a surprising twist, they show that LKB1 can act to promote carcinogenesis, a role normally possessed by oncogenes. Update: PNAS has published a commentary article about the findings in their "Journal Club" section, where recently published papers selected by Academy members are highlighted. The studies emanated from and interest by Fergal OFarrell (Rusten lab) and Viola Lobert (Stenmark lab) to explore the tumor suppressor mechanism of a lipid kinase - whose name is a mouthful -Phosphatidylinositol 3-kinase class III. PI3K-III for short. This kinase is situated on the late endocytic sorting station where it acts to sort vesicular cargo and ship them to the lysosome (the cell degradation bin), back to the cell surface or other organelles such as the endoplasmatic reticulum. The team found that PI3K-III has a conserved role in preventing structural breakdown of epithelia in both human organoid epithelia in vitro, and in vivo in Drosophila melanogaster - a powerful animal model for medical research. Capitalizing on the strengths of the two systems, they found that the Lkb1 protein- which attaches to intracellular membranes through a lipid anchor - is endocytosed and signals from endosomes. On the late endosome, PI3K-III produces the lipid product PI3P, that acts to recruit a protein effector WDFY2 through its lipid binding domain. WDFY2 exists in a complex with LKB1 and serves to contain its kinase activity and promote its ability to properly organize cells into a functional epithelium. In human and fly cells, mutations in PI3K-III or WDFY2 both lead to dysplasia-like epithelial growth - an early step in cancer development. In vivo, mutations in PI3K-III cooperate with the RasV12 oncogene to cause malignant tumor growth and killing of the animal due to the ectopic activity of LKB1. The surprising findings add mechanistic insight into the detailed regulation of LKB1 and provides clues as to how PI3K-III acts as a tumor suppressor. Cartoon (left): Loss of PI3K-III components or WDFY2 cause tumor-like growth (dysplasia). This is due to increased LKB1 activity which also leads to intracellular stress signalling through Jun N-terminal kinase (JNK). 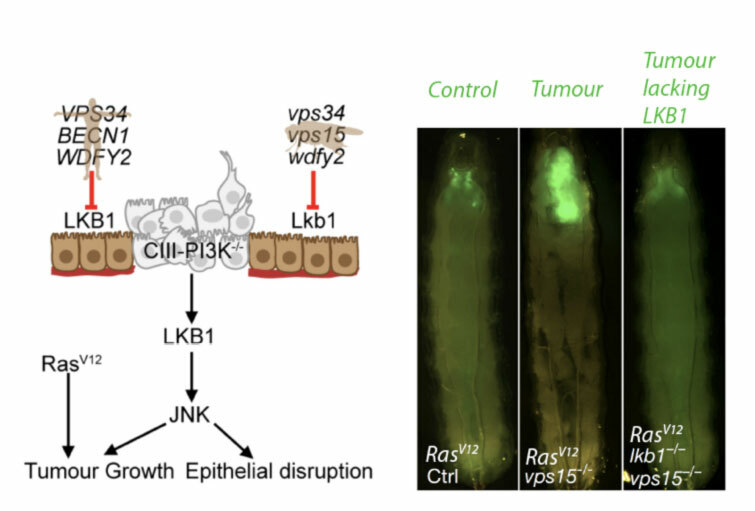 (right) Loss of the PI3K-III component vps15 cooperates with RasV12 to form tumors in vivo. Tumor growth depends on increased LKB1 activity. (Tumors in green of fly larvae). Class III phosphatidylinositol-3-OH kinase controls epithelial integrity through endosomal LKB1 regulation. O'Farrell F, Lobert VH, Sneeggen M, Jain A, Katheder NS, Wenzel EM, Schultz SW, Tan KW, Brech A, Stenmark H, Rusten TE. Eva Wenzel and Sebastian Schultz were not present when the picture was taken.